The term "SPCC Plan," as used in federal regulations under the Clean Water Act, stands for "Spill Prevention Control and Countermeasure Plan." An Oil SPCC plan is a plan prepared in accordance with good engineering practices to prevent and clean up spills from oil storage tanks. "Oil" as defined in the federal regulations includes petroleum oils such as gasoline, diesel and heating oil as well as non-petroleum oils such as animal or vegetable oils, synthetic oils, and mineral oils. The federal SPCC plan requirements apply specifically to oil storage facilities with an aggregate storage capacity greater than 1,320 gallons and where a discharge could reach a navigable water body, either directly or indirectly. Any oil storage container or tank that is 55 gallons or larger in size counts towards the total aggregate storage capacity. Most areas in Maine are considered locations where a discharge could reach navigable waters. 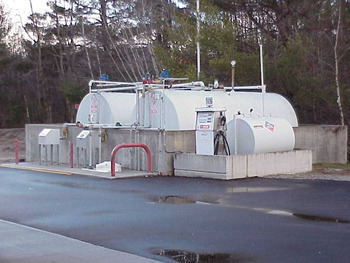 In 2002, the Maine Legislature enacted 38 MRSA § 570-K(5), giving the Maine DEP authority to oversee compliance with the federal SPCC requirements for aboveground storage facilities that exceed the federal 1,320 gallon aggregate storage capacity threshold and are used to market and distribute oil. An SPCC plan lists the containment equipment and structures used to prevent spills from reaching ground water or surface water, and it identifies the inspection, monitoring and oil transfer procedures that will be followed to prevent a spill. If a spill occurs, a well-developed Oil SPCC plan will identify whom to call, and will specify steps, or "countermeasures," to contain the spill and minimize environmental impacts. The specific SPCC requirements for oil storage facilities are found in federal regulation, 40 CFR Part 112. A qualified professional engineer must examine the plan and attest that it has been prepared in accordance with good engineering practices. For information on Maine's SPCC program that applies to facilities with more than 1,320 gallons of aboveground oil storage and that market or distribute oil to others contact the Maine Department of Environmental Protection: Division of Technical Services, Dept. of Environmental Protection, 17 State House Station, Augusta, ME 04333-0017; telephone: (207) 287-7688 or in-state toll free (800) 452-1942. For information on the federal SPCC plan requirements that apply to any facility with more than 1,320 gallons of aboveground oil storage contact the U.S. Environmental Protection Agency: EPA Region 1, 5 Post Office Square, Suite 100, Boston, MA 02109-3912; telephone: (888) 372-7341. The Department is required to submit a report to the Legislature every two years by January 15th. See Department Reports for the most recent and past reports. Maine's requirements for underground piping contact Maine DEP: Underground Oil Storage Tanks Contacts 207-287-7688. Marine Oil Terminals, please contact Maine DEP: Jamie Hoover 207-287-6113.